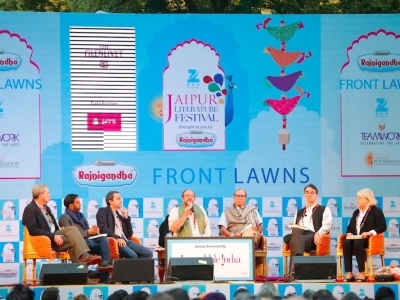 Verve reports live from Zee Jaipur Literature Festival. Catch the action from Day 3 and 4 right here…. It’s difficult to think objectively of a festival where Susmit Sen of Indian Ocean strums a guitar for you, Dadi Pudumjee brings comrade Puran to present a show of puppets and Arundhathi Subramaniam recites her poetry. There’s so much to see and absorb that at the end of the day, you feel like defying Stephen Chbosky and being a sponge (filter-sponge argument, anyone?). Day 3 brought with it a humorous talk with Paul Theroux, Brigid Keenan, William Dalrymple and others, who read their bit on travel writing with a specially hilarious reading on India and its tendency to term government organisations as “bodies”, leading to some atrocious headlines akin to ‘New Head for Body!’ Shashi Tharoor spoked to a packed Front Lawn on his book India Shastra followed by Akhil Sharma speaking about his fiercely successful book, Family Life. (You can read our discussion with the author here.) We moved on to a session on favourite audiobooks, Karadi Tales. There’s a new story out titled The Fox and the Crow which has some fabulous illustrations. Nostalgic times. Then came the absolute highlight of the day. Dadi Pudumjee, Puran Bhatt, Rajesh Bhat Nagori and Sanjoy Roy spoke about puppets, puppeteers in the session Kathputli: Of Puppets and Puppeteers. (Find our chat with Padma Shri recipient puppeteer Dadi Pudumjee here.) Amish Tripathi announced his next trilogy, the Ram series, amongst a lot of hoopla and fanfare. It got chillier. Everyone whipped out boots, jackets and shawls. The brilliant chai sold at the venue played its part in keeping everybody alive. We started the day with a talk by Sudha Murty and Namita Gokhale. Huge fans of the dynamic but endearing Murty, we had a suitably inspiring morning at the JLF. (You can read our talk with Murty here.) The day was filled with poetry. 52 Ways of Looking at a Poem had a panel of prominent poets recite poetry. It was an absolutely beautiful evening with Arundhathi Subramaniam winning the Khushwant Singh Memorial Prize for Poetry. Not having had our fill of poems just yet, we made a beeline for the Poetry Hour where another set of veteran poets read their work. One feels privileged to be hearing lines recited by Arvind Kumar Mehrotra, Nand Kishore Acharya, Meena Kandasamy, Helon Habila and a host of other brilliant poets. 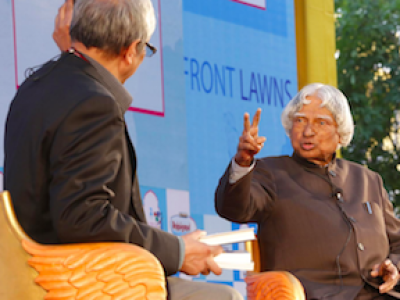 The day had an especially prestigious line-up of speakers with former president Dr APJ Abdul Kalam, newsman and author Rajdeep Sardesai and author VS Naipaul.